I usually make bread for the household about once a month. Since I love to bake bread but really only want one or two slices when the loaves come out of the oven, my friends and the roomies get to do a lot of the bread eating in our house. For me, it is a perfect system. I love having a built in test/focus group for my recipes! The last bread recipe I posted on here, Honey Oat Bread, was well received but no one went crazy for it. Delicious, yet standard, bread. This Rosemary Potato Bread was a much bigger hit! I decided to make this bread to use up leftover baked potatoes. (I always try to be as resourceful as possible and waste as little as possible. That is part of the inspiration for our garden!) I added some garlic chives from my garden for an extra pop of flavor. You could use any herbs you want to mix this up. I didn’t have both of my large pyrex loaf pans at home so I decided to make one loaf in a medium large casserole dish and turn the dough for the other loaf into clover top rolls. This was a VERY good choice. Those little buttery beauties where exactly what everyone wanted. It seemed like they were gone in minutes. I now know that I should make more rolls versus bread to keep a happy, full household. 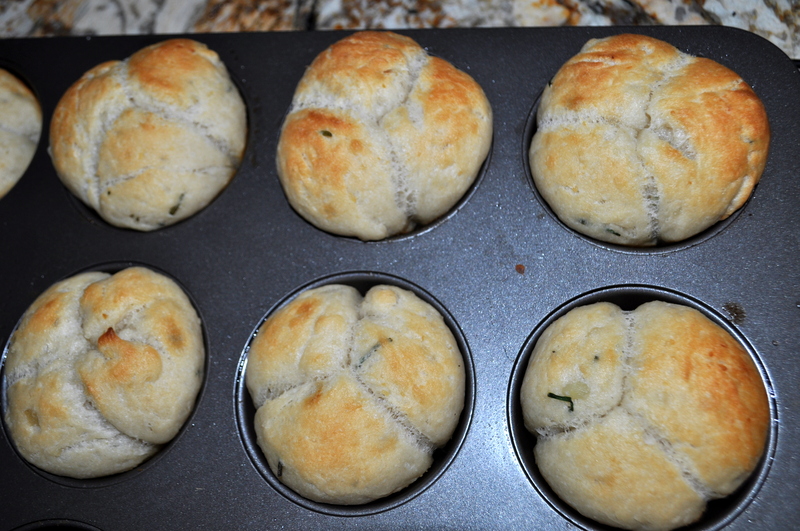 Clover top rolls are simply bread dough in another shape. I just use the exact same dough I would for a loaf of bread but shape and bake it in a muffin tin. Whichever way you decide to bake this dough, the resulting bread is extremely fluffy and light with a crisp buttery crust. I plan on making this one far more frequently now that I have a hit on my hands! I am so glad you like the recipe. Let me know how it turns out! It gets devoured in my house. 🙂 Happy Baking! All very good things! It is a great way to use up leftover baked potatoes. I always bake a couple extra when I make them with dinner so I can make home fries for breakfast. When I get too busy in the morning to make those, I make potato bread that evening!